Reading Victoria Martinez can be frustrating experience. While reading her work, most recently 'The Royal W.E. : Unique Glimpses of The Duke and Duchess of Windsor" I frequently find myself saying out loud, ‘She’s such a good writer. If only she had an editor who would…” Martinez has much to offer the reader, including an engaging voice and deep knowledge of her subject. But the lack of the restraining hand of a good editor has allowed Martinez' works to retain a certain air, call it enthusiastic amateurism, typical of writing produced for the blogosphere. According to the author, five of the seven essays in this short (approximately 130pp) ebook previously appeared on the Unofficial Royalty website. There are three over-long and fulsome congratulatory forwards from the author's 'mentors,' an author biography plus lengthy 'Acknowledgements' and 'Introduction,' meaning almost half the 'book' comprises other than titular materials. 'The Royal W.E.' is less than a good value for your reading dollar, even given its minimal download cost. ‘The Royal W.E.' is best seen as an intelligent digest of the primary scandals surrounding the Windsors. Topics include Wallis Simpson's perceived role in Edward VIII's abdication; rumors that the Duchess was a hermaphrodite; the infamous 1946 burglary of the Windsor jewels; the lifelong animosity between the Duchess and Queens Mary and Elizabeth. Though Martinez refers to her sources in the body of the text, there are no footnotes (except for the last essay, which may be original to this edition) and no list of sources to which the discerning reader can refer for proof texts. For example, in 'Not a Woman at All' Martinez tackles the rumor that Wallis Simpson was a hermaphrodite. She makes the solid point that if Wallis, Duchess of Windsor had the public relations consultants in 1936 that were available to Camilla, Duchess of Cornwall in 2006 we might never have heard such outlandish canards about Wallis, let alone seen them form the core of her enduring reputation. According to Martinez the rumor is based on one line in a biographer's (not of Wallis) diary, though here Martinez' casual approach to documentation lets her down. The diary was 'posthumously-published' 'in 1981' but is that when the remark was first known? What was the context? Did others misinterpret it, willfully or not? Martinez says, 'it wasn't the first time the idea...had been mentioned.' By whom? When? The author states, 'many of the materials that claim Wallis was a hermaphrodite include a statement that the condition was 'not well understood' in Wallis' time.' What materials? At what time? Wallis Simpson lived into the 1980’s. It may appear I am demanding academic standards from what is intended as light reading for the entertainment-oriented reader. However, Martinez herself says in her introduction, ‘I strive to perpetuate good scholarship and research over the opposite, and give readers a chance to make educated decisions for themselves.’ I merely do her the honor of taking he at her word.Martinez’ mastery of her subject shines in the final essay, 'A Fool Would Know,' where she brings clarity to the convoluted tale of the 1946 theft of the famed Windsor jewel collection. Distilling more than sixty years’ worth of police and press reports, interviews and rumors, Martinez’ analysis and theories are brief, appropriate and reasonable.There is no shortcut to quality: it is not enough to merely compile a list of blog posts. Ms. Martinez is a writer of talent and passion who deserves to see her best original work published. With the guidance of experienced editorial help, I believe Victoria Martinez can produce popular biographies and specialist history worthy of inclusion in discerning readers’ permanent collections. The Duke and Duchess of Windsor have a fascinating story, one that can be difficult to separate truth from myth for the layperson. Martinez, with her trademarked down-to-earth and captivating writing style, does this admirably, devoting chapters to specific rumors - many of which have taken over the narrative and the truth. In truth, the book reads more like a discussion among friends than something describing events of historical significance. This is generally the case for Martinez's books, and one of the reasons I don't even bother trying the sample before purchasing what she has written. Her evidence that Prince Edward was not the carefree and committed royal that the public assumed was fascinating, as was her explanations for Simpson's divorces. In today's world, Simpson might have been celebrated for leaving her first marriage - the times have truly changed. As with other books by Martinez, again the only complaints I have are the number of "pre-chapters" of introductions, praise, more praise, acknowledgements, and whatnot before the book begins. With this book my Kindle calculated 12% devoted to things I just skipped over. As Martinez's books tend to be fairly short to begin with, it does leave me with a rather unfulfilled feeling at the end, sort of like eating a large marshmallow. It looks delicious and filling, but is surrounded by quite a bit of air one has to work through to get to the deliciousness. Victoria Martinez attempts to write a more balanced account of the lives of the Duke & Duchess of Windsor. She explains a lot of Wallis' motivation and downplays many of the couple's bad behavior.The book was well researched and factual, I guess I will always be on the side of the Royals and I will never like "The American Divorcee" . Picked up this book after the recent spat of movies that involved the British Royals around and wanting to know more of the the Duke and Duchess's story. This little book gave a little glimpse of their story. 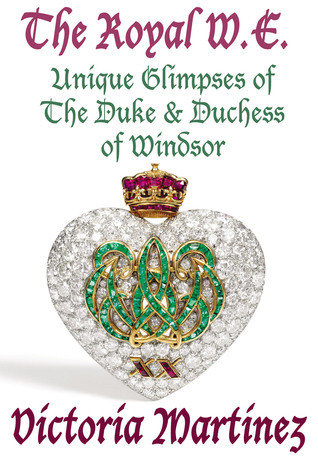 Fast read, a collection of essays about king Edward & Wallis Simpson. Could have been more interestingly written, but did have some fun tidbits in it. LongerExcellent book, I just wish it were longer and covered more of their lives, Jimmy Donahue and what happened while he was Governor. Mostly a rehash of other biographies. Boring. Not really a story and she tells facts - could get this from a web-site.